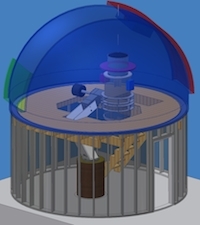 As construction for the Ash Dome for Telescope 2 begins on Haleakala, the ATLAS project is well on track for Telescope 1 to achieve First Light by the end of 2014. 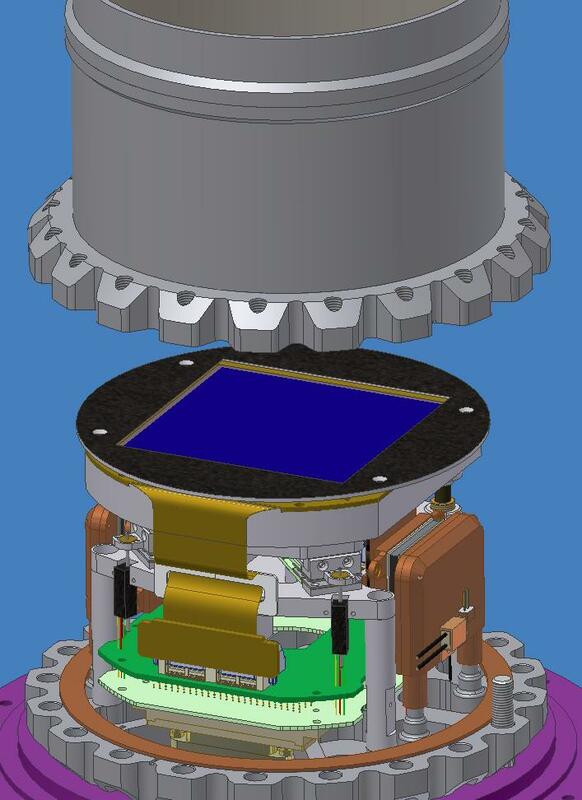 The CCD detectors and their control electronics currently being manufactured by STA should be ready for testing in a cryostat being built at the Institute for Astronomy within the next two months. The system will then be transferred to the manufacturer of the telescopes, DFM Engineering, in Colorado. Weather permitting we expect first light to be achieved in the DFM parking lot during November 2014. 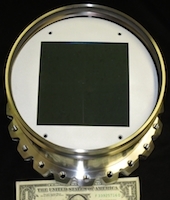 The ATLAS Camera (acam) cryostat parts shown in a test assembly to check the fit. 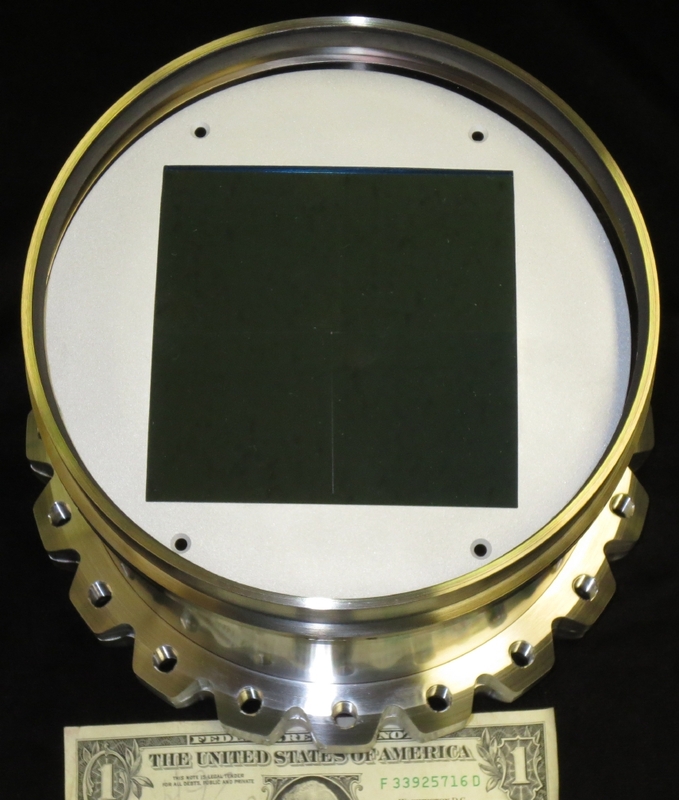 The black, square "detector" is actually pieces of anti-reflection coated silicon. DFM will deliver the final version of the two 50-cm telescopes for ATLAS by January 2015. DFM is also constructing the shutters and filter changers for these telescopes. The German company APM is constructing the mounts. and dome will look at each observatory when completed. Mauna Loa, Hawaii Island: The ATLAS team has an agreement with NOAA to use the Mauna Loa Observatory's 16.5-foot-diameter Ash Dome (plus an adjacent building for our computers) for the next five years. The dome is in excellent shape, though we are refurbishing its motor and its electronics. ATLAS needs a lot of Internet bandwidth, so we have purchased, installed, and successfully tested new dishes and microwave systems at Humu‘ula near the Saddle Road and at MLO. We now have an excellent fast link. Our thanks to Pui Hin and the IFA computer staff for their help. The Pathfinder telescope, a scaled-down predecessor of ATLAS, is currently mounted in the Mauna Loa Observatory dome and is successfully testing the telescope and camera control systems, as well as data and data processing software. Pathfinder is capable of operating entirely remotely. It can also be programmed to observe all night without human intervention. Since the UCAM was installed onto the Pathfinder telescope at the end of March 2014, we have made and reduced about 25,000 sky exposures. We have been focusing on optimizing our autonomous operations and our image reduction software. We are now ready to work on finding the moving objects in these images and calculating asteroid orbits from them that are reliable enough to be automatically forwarded to the Minor Planet Center. 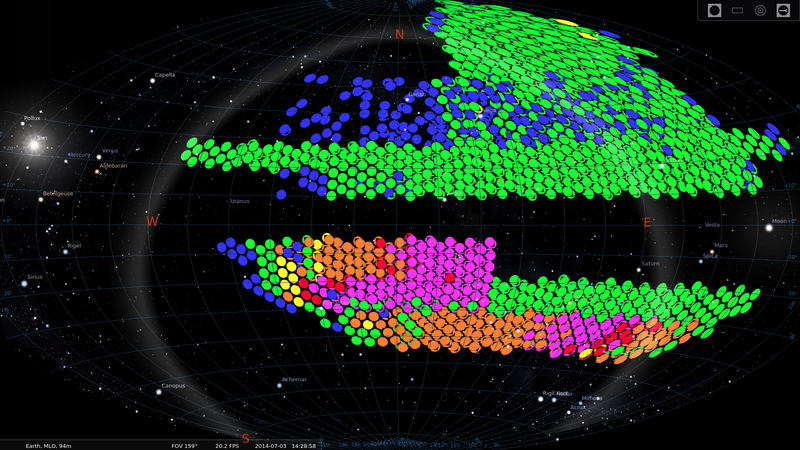 This test visualization shows all the exposures taken between June 20 and July 1, 2014. Single exposures are in blue, double exposures in green, up to six exposures for red. At Mauna Loa Observatory we have a fish-eye all-sky monitoring system as well as a computerized online weather station. Larry Denneau used the all-sky monitoring system to record a time-lapse movie of the Total Lunar Eclipse that occurred on April 14, 2014. 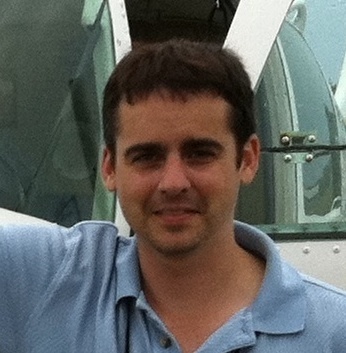 The ATLAS team welcomes Brian Stalder who joins the project as a post-doctoral fellow on August 1, 2014. Brian received his PhD at the IfA in 2007, studying the optical properties of high redshift radio galaxies and testing detectors and developing prototype cameras in the Pan-STARRS camera group. Upon graduating, he joined a team at Harvard University and Smithsonian Astrophysical Observatory leading the camera design and construction of PISCO, a simultaneous 4-band optical imager to be installed at the Magellan Observatory in Chile. He is also a developer of the Stellar Locus Regression technique for fast photometric calibration of astronomical data. While in Cambridge, he also became involved in Antarctic radio astronomy. Since 2008, he has been a collaborator on the South Pole Telescope project (a 10-meter millimeter wavelength telescope at the Geographic South Pole), working on the data analysis pipeline and leading the optical and infrared follow up of massive distant galaxy clusters detected via the SZ effect. He also contributes to the Stratospheric Terahertz Observatory (0.8-meter heterodyne survey telescope operating at 1.4 and 1.9 THz) long-duration balloon project, first launched during the 2011-2012 season, dealing with the hardware alignment of the optics and data processing. The ATLAS project —currently in the late, middle stages of construction — is coming together well within our budget and our timeline. By the next update near the end of 2014, we expect to have two working Ash Domes ready to receive Telescopes 1 and 2. Thank you for your interest in and support of ATLAS.